Ocean acidification is a global environmental issue caused by the man-made release of carbon dioxide into the atmosphere. It is often referred to as the “evil twin” of climate change because it is caused by the same factors (1). Since the Industrial Revolution the oceans have been acting as a “carbon sink” for carbon dioxide, slowing climate change and moderating its impacts on terrestrial life (2). Prior to the Industrial Revolution the oceans were in relative equilibrium with the atmosphere, absorbing and releasing the same amount of carbon dioxide each year, 2.15 billion metric tons (3). However, the amount of carbon dioxide has increased mostly due to the burning of fossil fuels and so has the oceans absorption. The oceans will continue to absorb carbon dioxide as long as the concentration in surface waters is less than the atmosphere and this will cause the pH of the oceans to continue to decrease, becoming more acidic (4). Chemists identify an acid or a base by the concentration of hydrogen ions which is shown by using the pH scale with a range of 0 – 14. The pH of battery acid is 0, extremely acidic with a lot of hydrogen ions, and hydrochloric acid is 1. The pH of bleach is 13 and liquid drain cleaner 14, extreme base or very low concentration of hydrogen ions. A neutral solution has a pH of 7. Tap water falls in the 6.5 – 8.5 range and pristine sea water is between 8 and 8.3 (5). The oceans are becoming more acidic, not turning to acid. There is a big difference between 8 and 14, though small changes have huge impacts. The pH scale is logarithmic so the changes in units may seem incremental but in fact represent major changes. For example, a small drop of 0.4 units in pH represents a doubling in acidity in the ocean (6). In 1750 ocean surface pH was 8.19. In 2008 it was 8.09 meaning the pH of the ocean surface has already fallen 0.1 units, representing a 30 percent increase in acidity (6). By 2040, just 25 years from now, it will be 7.97 and the oceans will be vastly different if nothing is done to change the course (7). The current rate of change in the ocean’s pH is 100 times faster than the maximum rate over hundreds of thousand years (8-9). Oceans and wildlife are sensitive to increased acidity, especially with rapid change. A human can enjoy a can of Coke, with a 2.5 pH, but pour even a small amount into your fish bowl and the results are not the least bit enjoyable for the fish. So how are the oceans becoming more acidic? When carbon dioxide is absorbed by the oceans it reacts with water and forms a bicarbonate ion and a hydrogen ion. This hydrogen ion can then bind with a carbonate molecule that would otherwise be available to make calcium carbonate. This unbalances the system away from carbonate ions, reducing the availability of this molecule, making the oceans more acidic. Reducing the availability of carbonate ions also harms sea life (10). The oceans have a complex natural way to restore balance, however, the system is being overwhelmed by the influx of carbon dioxide (8). The oceans currently absorb 30 million metric tons of carbon dioxide daily, nearly twice the amount emitted by the U.S. every day (11 and 12). So what is the impact of ocean acidification on our oceans? 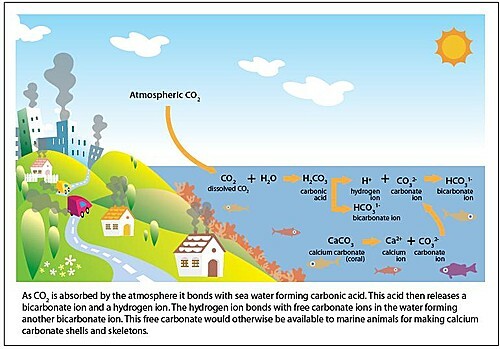 Species that will be affected by a decrease in availability of carbonate ions include: corals, starfish, oysters, crabs, shrimp, sea urchins, mussels, lobsters, coccolithophores (type of phytoplankton), pteropods (sea snails) and foraminifera (plankton related to amoebas) (8 and 13). The inability of these organisms to calcify and create structures such as shells and skeletons impacts their ability to grow, anchor and reproduce and could trigger secondary effects throughout marine ecosystems and food webs (8 and 13). These species are vital to healthy oceans and commercial fisheries. For example, coral reefs provide habitat for as many as 4,000 species of fish (14) and provide $30 billion annually to the global economy through coastal protection, tourism, fishing and other goods and services (15 and 16). Pteropods account for 45 percent of the diet of juvenile North Pacific salmon (17). The North Pacific salmon fisheries provided $3 billion in income to fishermen and supported 35,000 jobs in 2007 (18). Other commercially important fish species dependent upon pteropods include mackerel, herring and cod (6 and 19). Ocean acidification also effects respiration stress. As oceans become warmer they hold less oxygen making it more difficult to breathe and species like squid are very sensitive to lower oxygen levels (20). Declines in population could hurt local economies, like the $25 million annual squid (calamari) fishery in California (21). Colder oceans are more sensitive to ocean acidification so the extreme north and south poles are already seeing change (22). Unfortunately, these oceans are vital feeding grounds for species such as whales. And closer to home, oyster fishermen in Oregon and Washington are seeing smaller yields due in part to more acidic conditions (23). However, some species may benefit from ocean acidification such as photosynthetic algae and seagrasses, which may have positive and negative effects (24). Though the U.S. is not dependent on fish for our animal protein, many countries are and a disruption in the food web will destabilize some societies potentially making them more dangerous (25 and 26). What must be done to slow ocean acidification and save our oceans? We must stabilize atmospheric carbon dioxide at or below 350 parts per million (ppm) (27). The current level is 400 ppm (28). Industrialized nations must reduce emissions 25 – 40 percent below 1990 levels by 2020 (just 5 years from now) and global emissions must be reduced at least 85 percent below 2000 levels by 2050 (just 25 years from now) (29). There is no legitimate debate regarding whether ocean acidification is happening or not – it is a fact. Since nothing has been done to stop this problem to date we are now facing an impending crisis and actions must be taken immediately to reduce carbon dioxide emissions. There really is no time to waste. The specific citations, and additional ones not from these reports, are listed below. Sabine, C.L. et al (2004) The Oceanic Sink for Anthropogenic CO2, Science, 305: 367-371. Orr, James C. et al (2005) Anthropogenic Ocean Acidification Over Twenty-first Century and its Impact on Calcifying Organisms, Nature 437: 681-686. Siegenthaler, U. et al (2005) Stable carbon cycle-climate relationship during the late Pleistocene, Science 310: 1313-1317. IPCC (2005). “IPCC Special Report on Carbon Dioxide Capture and Storage” (PDF). p. 390. Feely, R.A. et al (2008) Evidence for Upwelling of Corrosive “Acidified” Water on Continental Shelf Report, Sciencexpress, 10: 1126. Calculated from: EIA (2007) Emissions of greenhouse gases in the United States 2006, DOE/EIA-0573 (2006). Caldeira, Ken (2007) What Corals are Dying to Tell Us: About CO2 and Ocean Acidification, Roger Revelle Commemorative Lecture, Oceanography, 20(2): 188-195. Stone R. (2007) A World Without Corals? Science, 316(5825): 678-681. Hoegh-Guldberg, Ove (2005) Low Coral Cover in High-CO2 World, Journal of Geophysical Research 110: C09S06. Cesar, H et al (2003) The Economics of Worldwide Coral Reef Degradation, Cesar Environmental Economics Consulting. Aydin, K.Y. et al (2005), Linking ocean food webs to coastal production and growth rates of Pacific Salmon (Oncorhynchus spp.) using models on three scales. Deep Sea Research Part II: Tropical studies in Oceanography, 52(5-6): 757-780. The Research Group (2009) North Pacific Salmon Fisheries Economic Measurement Estimates version 1.2 Wild Salmon Center, Portland Oregon. Seibel, B.A. and H.M. Dierssen (2003) Cascading trophic impacts of reduced biomass in the Ross Sea, Antarctica: Just the tip of the iceberg? The Biological Bulletin, 205: 93-97. Rosa R. and B. Seibel (2008) Synergistic effects of climate related variable suggest future physiological impairment in a top ocean predator. Proceedings of the National Academy of Sciences of the United States of America. 105(52) 20776-20780. California Department of Fish and Game (2009) Review of Selected California Fisheries for 2008: coastal pelagic finfish, market squid, ocean salmon, groundfish, Caifornia spiny lobster, spot prawn, white seabass, kelp bass, etc. Cal/COFI Rep, 50: 14-42. Hoegh-Guldberg, Ove et al (2007) Coral Reefs Under Rapid Climate Change and Ocean Acidification, Science 318: 1737-1742 and Pers. Comm. Ove Hoegh-Guldberg and Hansen, J. et al (2008) Target Atmospheric CO2: where Should Humanity Aim? The Open Atmospheric Science Journal, 2: 217-231. * Corry Westbrook was legislative director for National Wildlife Federation for nine years, federal policy director at Oceana for two years and previously worked for the Environmental Protection Agency. 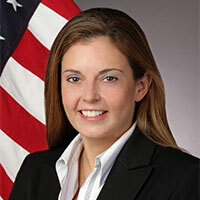 She has a MA from George Washington University in Environmental and Natural Resource Management and has worked on policy and legislation to slow climate change for over a decade; including leading efforts to pass the American Clean Energy and Security Act in 2009.